Born in 1967 in Tehran, Iran, Samira Alikhanzadeh started painting in 1987 under the supervision of the Iranian Master Aydin Aghdashloo. Two years later, she attended Tehran’s Azad University where she continued to complete her MA in painting. 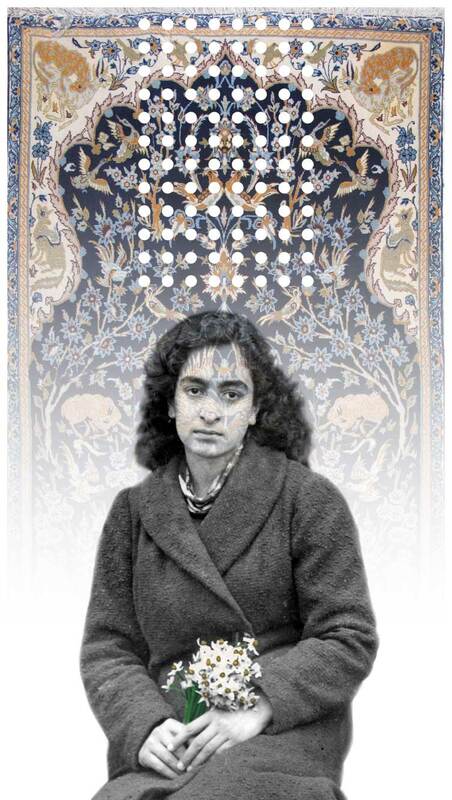 Being fascinated with the issues of identity and reality in relation to past and present and finding inspiration in the melancholic and humoristic quality of old images, Alikhanzadeh uses old found photographs, mainly family photos of the 1940s and 50s to create her artworks. Whereas initially she used photographs in her collage work, in her latest works, her images are printed digitally on either wooden boards or Perspex. By using mirror, she playfully manages the viewers’ own presence in the work. That presence itself is manipulated even further through the usage of diagonal mirrors in order to create distorted and unreal images in some of her later works. Moreover, she enjoys experimenting with new materials and in addition to her main and recurring tools of mirrors and acrylic, she is also keen on using real carpets in some of her works. Alikhanzadeh lives and works in Tehran where she regularly exhibits. She has taken part in over 30 exhibitions and art fairs in North America, Europe and the Middle East since 1995. In addition to her works being part of important private collections worldwide, two works from her Carpet series were acquired by LACMA (Los Angeles County Museum of Art) in 2010.